Happy New Year! Things are “looking up” in backyard astronomy — at least for the remainder of this week. With the skies relatively clear until the weekend, and the waxing crescent Moon, the resulting sky glow is not bright enough to present much of a problem for evening sky watchers. 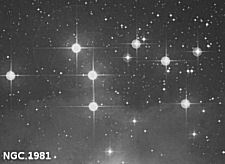 One of the most spectacular sights to be had for amateur astronomers on these cold clear winter evenings is the central region of the constellation of Orion. This region is home to large bright nebulae and open clusters easily visible in a small telescope or binoculars. I mentioned M42, the Great Orion Nebula which is the brightest deep sky object in this region last year at this time. Two objects in this area besides M42 are special treats. 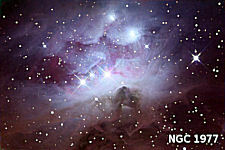 The first, NGC 1977, is known as the Running Man Nebula. NGC 1977 is a beautiful blue emission nebula with a dark reflection nebula inside it. Because of the reflected glow from brighter and larger M42, the darker parts of NGC 1977 reflects the colorful hues of M42 and imbue it with a mysterious, ghostly quality. Some have come to refer to NGC 1977 as the Ghost Nebula for this reason. 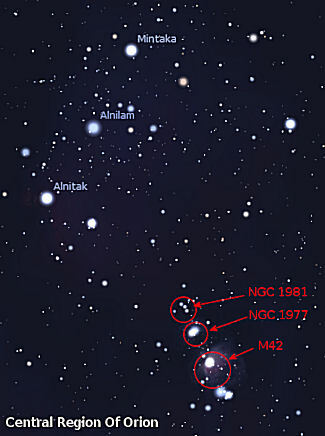 The second object, NGC 1981, is a large open cluster just above NGC 1977. NGC 1981 is a beautiful sprinkling of 10 or 11 bright stars in the Orion-Cygnus Arm of the Milky Way Galaxy, peppered with a background of the much more distant stars of other regions of the Milky Way. All of the stars in the cluster and the two nebula mentioned above are relatively close neighbors of the Solar System, at a mean distance of only about 700 light years from Earth. This makes it one of the nearest star forming regions we have available for study. Two other deep sky objects in this region surround the star known as Alnitak, or Zeta Orionis (ζ Ori.) This triple star system, the easternmost star in the Belt of Orion, is surrounded by two well-known faint emission nebula, B33, the Horsehead Nebula, and NGC 2024, the Flame Nebula. 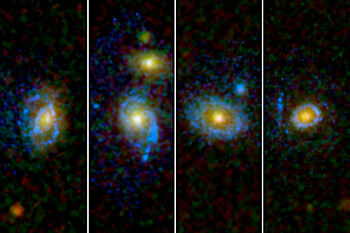 These are normally not visible in small telescopes or binoculars, but they are a popular target for astro-imagers. By 7:30 PM CST Wednesday evening, the Moon has set and the Winter Triangle is well up in the east-southeast, consisting of Betelgeuse in Orion's leftmost corner, bright Sirius in Canis Major below and to the right, and Procyon in Canis Minor to the left of these two. The Winter Triangle is brighter and more colorful than it's well-known summer counterpart. An even larger asterism, the Winter Hexagon, includes Procyon and Sirius, along with four other bright, colorful stars in the eastern evening sky: Rigel in Orion; Aldebaran in Taurus; Capella in Auriga; and Pollux in Gemini. 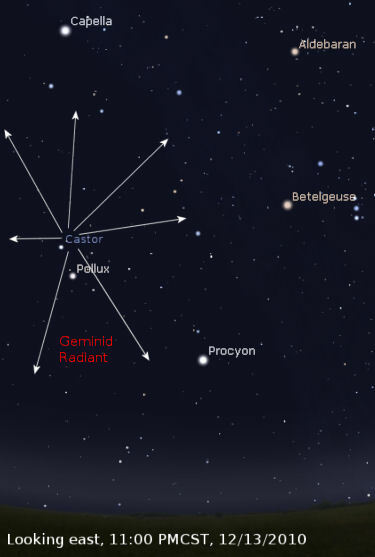 The brightest "star" in the evening sky this week is NOT a star, but a planet! As the current Evening Star, Jupiter still shines at magnitude -2.3 in Pisces, high in the south above Fomalhaut in Piscis Austrinus. Jupiter is receding from us as Earth begins to round the far side of the Sun from Jupiter, so it appears only 38 arcseconds wide. However, Jupiter is still wide enough to see the South Equatorial Belt re-forming and the transits of the Great Red Spot in a small-to-medium telescope. Uranus is now very close to Jupiter, just 0.6° to the west of the larger planet. Both planets should be close enough so they are both visible in the same field of view in a small telescope when using a medium power eyepiece. A third planet, Neptune, is also still visible in the early evening southwestern sky west of Fomalhaut, on the border between Aquarius and Capricornus. This one is much harder to spot and requires a small telescope or binoculars. Bright Saturn rises about 30 minutes past midnight this week. By 3:30 AM CST, Saturn is in a perfect position for viewing, high in the southeastern sky in Virgo. That puts it above the thick lower atmosphere long before the sky glow begins in the east as the rising Sun approaches the horizon. The rings are tilted now at about 10°, widening as spring approaches. The rings haven't been this wide since 2007. Later in the morning this week, very near dawn, Venus shines in the southeastern sky. Though very bright at magnitude -4.3, viewing Venus, in a telescope reveals itself to be only half-lit. Venus is very nearly at it's greatest elongation from the Sun. Venus will begin to grow gibbous in the coming months, while shrinking in diameter as it begins to swing around the far side of the Sun in its faster orbit. Mercury, too, will be relatively bright at magnitude 0, low in the southeastern sky just before dawn. Notice fainter Antares in Scorpius and the rest of the starry background of the Milky Way, rising in the east before dawn as the winter season marches on. Backyard Astronomy Extra - Total Lunar Eclipse! On Saturday evening, look just to the left of the Moon a mere 2° for the delicate Pleiades star cluster. The Pleiades is a beautiful, fairly tight open cluster in Taurus that was used by Native American tribes to test the eyesight of their scouts. See if you can see more than 5 stars in the Pleiades with the naked eye. If so, then you would have qualified as a scout in the Old West. 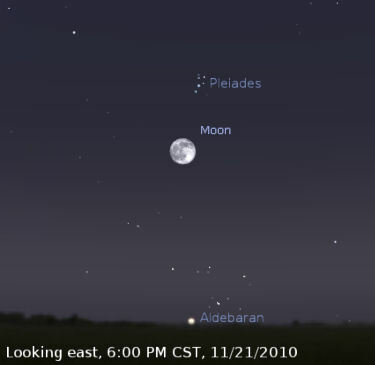 This week, you may need to use binoculars to see the Pleiades due to the overwhelming glare of the waxing gibbous Moon. Below the Pleiades by about a fist-width is orange Aldebaran. Aldebaran is part of the Hyades star cluster, an open star cluster in Taurus that looks to most like a small “V” laying on its side in the eastern sky. Far off to the left of the Hyades shines brighter yellow Capella. 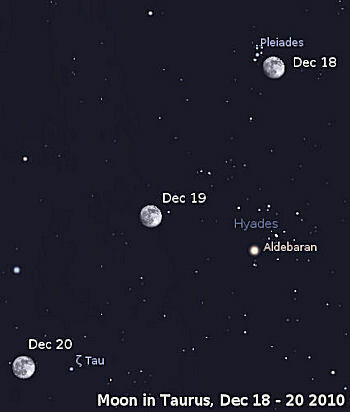 On Sunday evening, the Moon is to the left of the Hyades, and just to the left of a small star named Tau Tauri (τ Tau). By Monday evening, the Moon has moved just to the left of Zeta Tauri (ζ Tau.) By now, you've realized that the Moon has taken three nights to pass from one end of Taurus to the other. But the REAL highlight of the week is still yet to come. On Tuesday morning, the Full Moon occurs right at the mid-point of a total lunar eclipse! 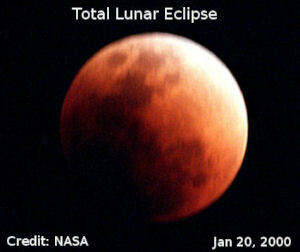 Make plans now to see this last lunar eclipse of the year. 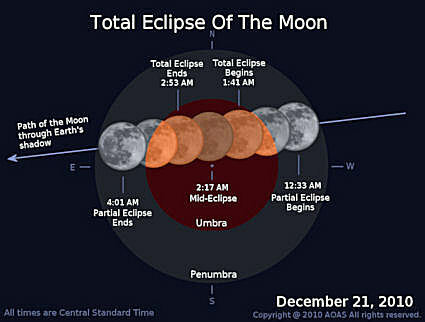 The eclipse begins just after midnight in the early-morning hours of Tuesday, December 21, 2010. The eclipse reaches its mid-point at about 2:17 AM CST Tuesday morning. The Moon will be shining brightly very high in the early-morning sky during the eclipse, in the south-southeast. By the time it reaches mid-eclipse, the Moon will be high in the southwest, and will drop into the western sky by the end of the eclipse at 4:01 AM. The best way to view this eclipse is with a pair of binoculars or a small telescope. The dim Little Dipper (Ursa Minor) hangs just about straight down from the North Star by about 9:30 PM all this week, as if it was hung from a hook on the wall of the sky. The brighter Big Dipper (Ursa Major) is rearing upward on its handle low in the north-northeast. 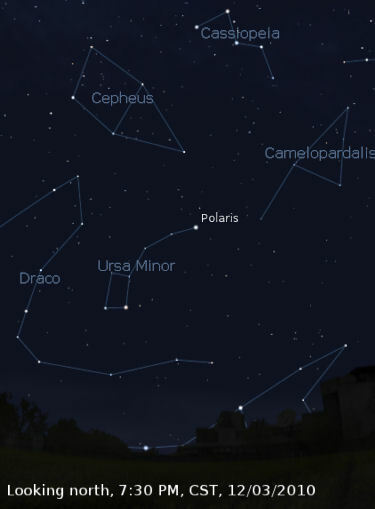 You can easily find Polaris, (or the North Star,) by using the two end stars of the bowl of the Big Dipper. 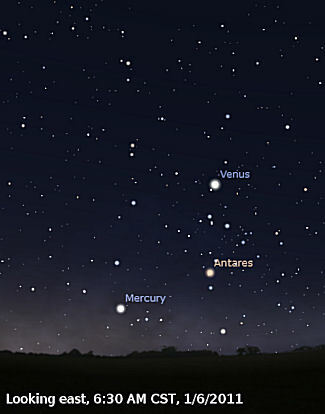 Venus shines with a brilliant light in the southeastern sky this week before and during dawn. Venus now rises about two hours before the first light of dawn (about 3:45 AM CST,) and rises to an altitude of about 33° before getting lost in the glare of the rising Sun. While it's till dark, look for fainter Spica well to Venus' upper right, and for Saturn above Spica. Look off about twice that distance to Venus' upper left for Arcturus. Saturn's rings have widened to 10° from edge-on, and present an interesting sight along with its larger moons in a small telescope. Of course, Jupiter shines almost as brilliantly as Venus during the evening, high in the south-southwest. The long-absent South Equatorial Belt continues to re-form, as dark markings spread east and west around the planet from a storm that broke out in the SEB's latitude about a month ago. Uranus is still within 2° to the left of Jupiter, and can be spotted in a small telescope. Have a look at Jupiter first, and then look for an object to the upper left of Jupiter with about the same brightness as Ganymede. 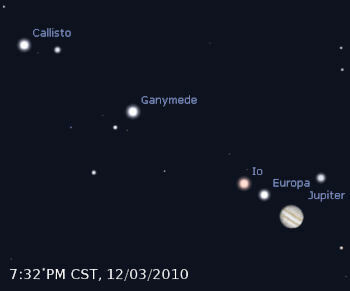 Ganymede is about magnitude 5.36 where Uranus is very slightly dimmer at about magnitude 5.45. Don't confuse Uranus with the star 20 Pisces (20 Psc,) which is also the same magnitude, but it is somewhat redder, and about halfway in between Jupiter and Uranus. Neptune is much dimmer at magnitude 7.9, and is still up in the southwest in Capricornus after dark. Look for 5th-magnuitude Mu Capricorni next to it. If you can get out and observe in the two hours before the coming of dawn this week, Venus blazes in the southeast, even after sunrise. Venus is still at its highest luminosity, at magnitude –4.8 and nearly as high as it gets. 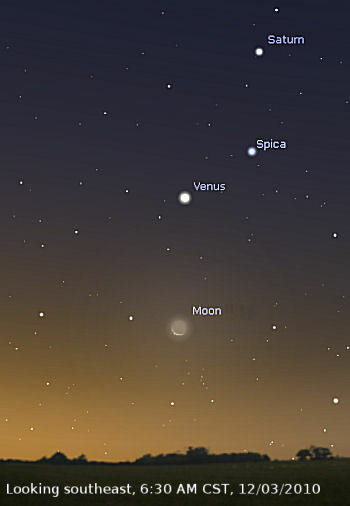 Can you watch Venus past sunrise with your naked eye? 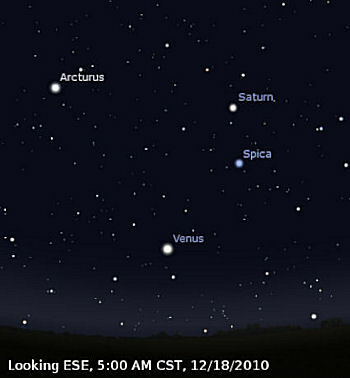 Look for much fainter Spica to Venus' upper right (about 20°,) and for Saturn about 20° above Spica. 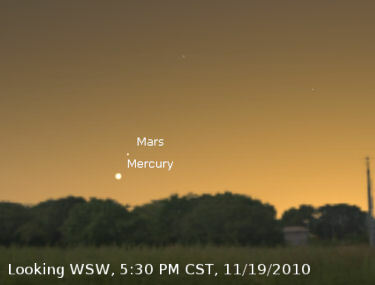 In the evenings this week, Mercury remains in view low about the southwest horizon during twilight. Look about 40 minutes after sunset. Mercury fades from magnitude –0.4 to +0.1 this week. 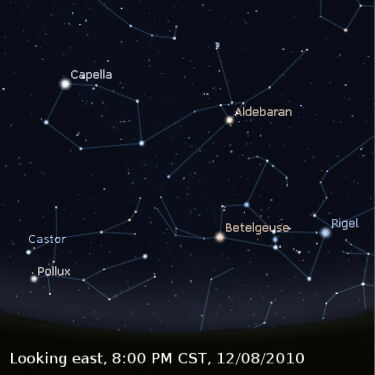 On Wednesday Dec 8th, by 7 or 8 PM CST, bright Capella in Auriga is high in the east-northeast. To its right in the east is the Pleiades (M45), or Seven Sisters, and below it is ruddy Aldebaran in Taurus. Below Capella lie Castor and Pollux, the heads of the twins of Gemini. It will be important to know the location of these twins early next week. As soon as it gets dark on Thursday evening, look for the waxing crescent Moon in the southwest. To the right of the Moon about 7°, is tiny Alpha Capricorni (α Cap.) If you have sharp vision you can barely see that this is a very close double star. You can resolve it easily in binoculars. By Saturday evening, the nearly first-quarter Moon this evening forms a roughly equilateral triangle with bright Jupiter to its upper left and Fomalhaut to its lower left. The Moon reaches First Quarter at 7:59 AM CST, on Monday December 13th. Monday, December 13th near midnight marks the start of the peak of the Geminid meteor shower for this year, and for most observers, it is the highlight of the week. The peak of the shower continues through the night into the morning hours of Tuesday, December 14th. The name “Geminids” refers to the fact that the radiant for this meteor shower appears to come from the heart of the Twins of Gemini. When meteors are traced back to their apparent origin, the paths they followed all converge at a point on the sky known as the radiant. From now until December 13th, hourly rates increase until a peak of 50-80 meteors per hour is attained. The rate then tapers off until the last Geminids on December 18th, when the rates fall to one every hour or so. Meteor showers occur all the time, but most are very weak. So there may be stray meteors that are not part of the Geminids during this time as well. When you see a meteor, how do you know if it's a Geminid? 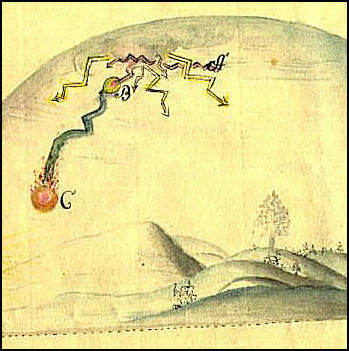 Trace the path of the meteor back to its apparent origin. If that origin ends up being in Gemini or close to it, then it's probably a Geminid. The best way to observe the Geminid Meteor Shower is lie back on a chaise lounge with a clear view of the sky toward Gemini. This time of year, be sure to dress warmly, get a thermos of coffee or hot chocolate, and maybe even throw on a blanket or two. As you lie there, look high up and all around the sky, and don't focus in just one place. Meteors will appear all over the sky, but the majority will appear to have come from the direction of Gemini, so we face the chaise lounge that way. But we scan from overhead down to about 30° up the sky. 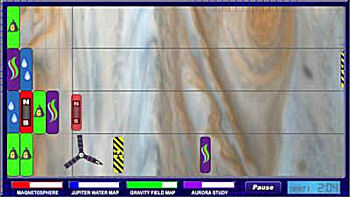 We also scan off to the right, and then to the left, looking at the big picture rather than focusing in any one area. Don't discount the sky opposite Gemini, either. Meteors can be seen all over the sky. See if you can count the number of meteors you see in an hour's time, and note the time of night. On a historical note, the Geminid meteor shower appeared suddenly in the latter part of the 1800's. R. P. Greg of Manchester in the UK first noted several meteors that had a radiant in Gemini in December of 1862. Several other observers independently discovered the same activity the same year from the United States. Early observations in the late nineteenth century reported the hourly rates at about 14 per hour. As the century waned, the hourly rate seemed to increase to about 23 per hour, with many more bright meteors. These rates have continued to increase throughout the 20th century, averaging about 50 per hour mid-century with the peak rate reaching an average of 80 per hour in the 1980s. The peak hourly rate continues to remain at 80 per hour today. Scientists now think the Geminids are tied to the passage of an asteroid (or minor planet,) 3200 Phaethon, in our solar system across Earth orbit every few years. 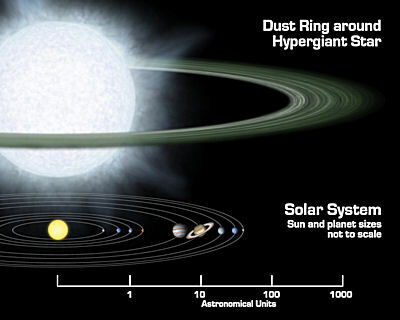 The Earth passes through the dust and debris left in its wake, creating tiny meteors in our upper atmosphere as we pass. On Friday morning, about 1/2 hour before dawn, look for a razor-thin crescent Moon far below Venus in the southeastern sky. Venus is at its maximum brightness magnitude –4.9, and as is commonly known as the “Morning Star”. Far above Venus is Spica in Virgo, and above that, Saturn at magnitude +0.9. Saturn's rings are 9° or 10° from edge-on now, and early dawn is the best time to observe the ringed planet all this week. Early in the evening all week, the constellation Cassiopeia floats very nearly directly overhead when you face north. Look for an M-shaped grouping of stars high above you for Cassiopeia. About halfway from Cassiopeia to the horizon lies Polaris, the North Star. 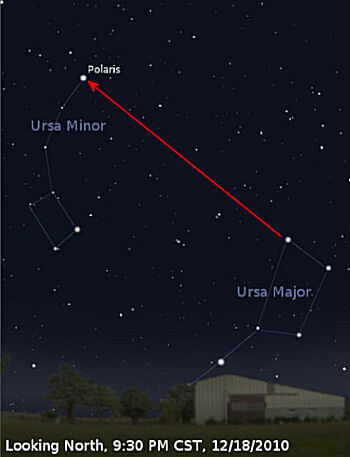 Polaris is the brightest star in the otherwise dim constellation of Ursa Minor, commonly known as the Little Dipper. Far below Polaris, and very nearly below the horizon, lie the upper-most stars of the Big Dipper asterism, part of the constellation of Ursa Major. The tail of Draco wends its way between Polaris and the stars of Ursa Major. This far south, you may not even be able to spot the stars of Ursa Major without finding a nearly flat horizon clear of obstructions. Jupiter shines high in the south to southwest during evening, the brightest star-like point in the evening sky. Jupiter's missing South Equatorial Belt is finally starting to re-group, becoming barely visible as dark material spreads from a series of telltale bright storm spots that appeared three weeks ago. On Friday evening, Jupiter's moon Europa reappears from eclipse out of Jupiter's shadow around 7:30 PM CST. Watch and wait for a few minutes, and a small telescope will show it gradually become visible just east of the planet. Later in the evening, look to the east to see the starry harbingers of Winter, orange Aldebaran in Taurus, fiery red Betelgeuse and blue-white Rigel in Orion, bright yellow Capella in Auriga, the Twins — Castor and Pollux in Gemini, brilliant blue-white Sirius, the brightest star in the sky — and the brightest in Canis Major. Don't forget the white binary star system Procyon in Canis Minor, considered the seventh brightest in the sky. 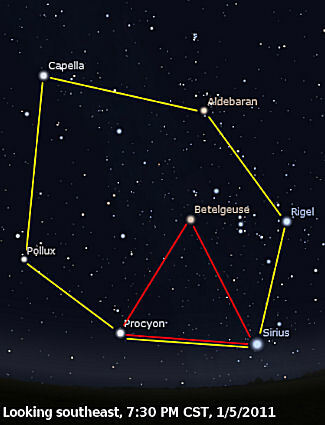 Betelgeuse, Sirius, and Procyon make the three vertices of the Winter Triangle asterism. 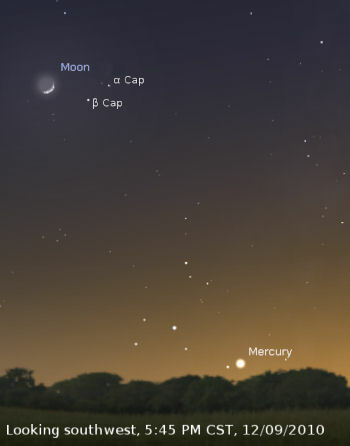 Mercury, at magnitude –0.4 is now at the best time for observing its current evening apparition. Still, it's quite low on the horizon, and a challenge. Look for it in mid-twilight just above the southwest horizon. This week is a great time to see Iridium Flares, both in the morning and evening. At 6:02 PM CST on Sunday, December 5th, Iridium 63 flares to magnitude -0 low in the western sky at an altitude of 11°. Just a few minutes later at 6:37 PM CST, Iridium 49 flares to magnitude -2 at an altitude of 30° in the south. Early Monday morning, at 7:01 AM CST, Iridium 46 flares to an absolutely brilliant -8 magnitude high up in the sky at 71° altitude. Look for it at azimuth 339° (in the NNW.) This is the brightest flare that will occur over the coming week. Monday evening, Iridium 65 and 66 put on a show at 5:47 PM and 5:56 PM CST, respectively. Iridium 65 will flare to magnitude -1 and Iridium 66 will reach magnitude -2. Both satellites will be low (at altitudes of 13° and 10°) in the Western sky. On Tuesday morning at 6:55 AM CST, we see Iridium 46 reach a fairly bright magnitude -5, pretty high up at an altitude of 69° in the NNW, and then Tuesday evening at 5:41 PM CST, Iridium 68 also flares to magnitude -5 low at an altitude of 14° in the Western sky. 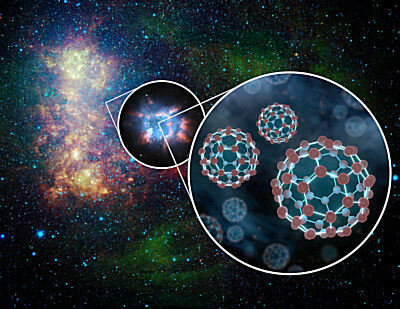 You can find out more about these at the Heavens Above web site. Unfortunately, business travel demands have kept me away from this column for a couple of weeks. It's good to be back! Well, it looks like there will be some clear skies and great opportunities for night-time sky watching Thursday through Sunday this week. To get a better idea how the night sky viewing will be for the next two evenings, check out the Fort Smith Clear Sky Chart. This chart will tell you how dark the sky will be, when you can expect cloud cover during the night, and what transparency and seeing conditions are expected. On Wednesday evening, Jupiter will be slightly higher and about 20° to the right of the waxing gibbous Moon. The Moon reaches the Full phase on Sunday, November 21 at 11:28 AM CST. 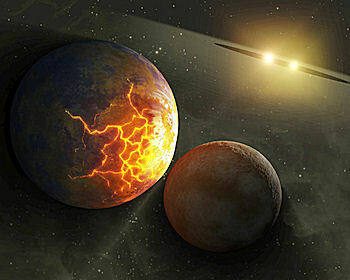 As a result, it will be a bright beacon in the night sky all week, washing out all but the brightest stars and planets. There will be early-morning dark skies late this week (Thursday & Friday,) as the Moon sets at about 3:00 AM CST on Thursday morning, setting about an hour later each morning until later in the week when it remains visible the entire night. The bright star Vega in the constellation Lyra remains the brightest star in the west-northwest these evenings. The brightest star higher above it is Deneb in the constellation Cygnus. 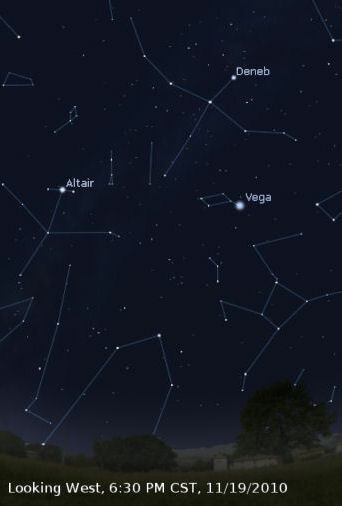 To the left of Vega lies the third member of the Summer Triangle, Altair, in the constellation Aquila. Both the cool crisp air and the Summer Triangle low in the western sky are sure signs of approaching winter. For a challenge this week, use binoculars to scan for Mercury very low in the southwest less than a half hour after sunset. Mars is less than 2° to Mercury's upper right. If you place Mercury in the lower left of the field of view, you should be able to detect fainter Mars above and to the right. By 9:00 PM CST Saturday, November 20th, the constellation Orion has risen in the east-southeast. Look for it far below this evening's high, bright Moon. The three unmistakable belt stars in Orion will be lined up vertically, with the bright blue-white star Rigel on the right, and fiery-red Betelgeuse on the left. 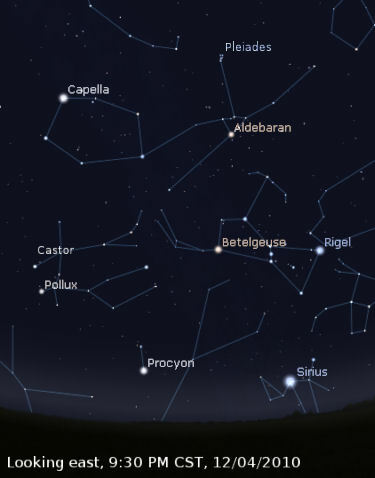 Halfway between Betelgeuse and the Moon is another bright red star, Aldebaran, in Taurus. 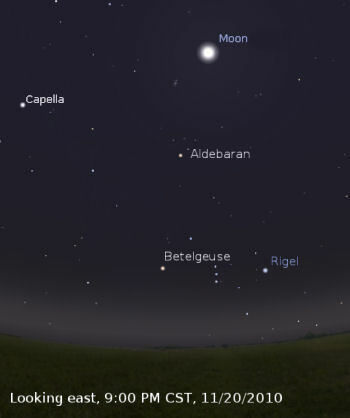 Draw an imaginary line from the Moon down through Aldebaran to Betelgeuse, and then imagine a line perpendicular to the first one, to the left of Adebaran you should see the bright yellow star Capella, in the constellation Auriga. On Sunday evening, the Full Moon passes just below the Pleiades (M-45,) an open cluster in the constellation Taurus. At closest approach the Moon is just slightly more than 4° from the center of the Pleiades, or just over the width of two fingers held at arm's length. This week, Venus is rising ever higher at dawn in the east-southeast. Look a little above it or to its upper right for much-fainter Spica in Virgo. Look higher (about 16°) above it for Saturn. Saturn's rings have widened to a tilt of about 9° from edge-on. The best time for observing Saturn with a telescope is about an hour before sunrise, or about 6:00 AM local time, when the planet will be above the “muck” -- the haze and turbulence found close to the horizon. You may also be able to catch a couple of bright Iridium Flares this week. Iridium 41 flares to -6 magnitude at 4:51 AM CST on Thursday morning. Look for it in the south at an altitude of 21°. Then on Sunday evening at 5:58 PM CST, you can catch Iridium 66 flare to magnitude -7 in the south at an altitude of 33°. Early on Monday morning, Iridium 62 flares to magnitude -4 nearly overhead at an altitude of 59° in the north-northwest. There are a several other chances to catch Iridium Flares, this week albeit at dimmer magnitudes. Be sure to check the web site at Heavens Above for times and positions.